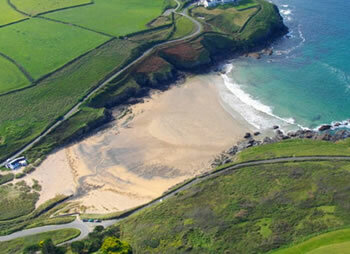 Poldhu Cove is located on the west coast of the Lizard Peninsula in Cornwall roughly a mile north of Mullion village. It has one of the largest beaches on the Peninsula which makes it popular during the holiday season. This Cornish beach has golden sand and the sea is beautifully clear which makes it a perfect place for relaxing or for seaside beach holidays with the children. Poldhu Cove is a mecca for surfers and body boarders. The cove is a safe place for bathing and swimming due to its long sandy shelf and RNLI lifeguard cover is present during the summer season May through to September, 10am to 6pm. There is the Poldhu Cove Café located at the entrance to the beach which serves all manner of refreshments from hot and cold drinks, ice creams and snacks through to hot meals. Gifts and beach accessories are also available from the shop. There is ample parking at Trewoon for holiday cottage vistors. There is also a large car park just across the road from the beach. Dogs are not permitted on the beach from Easter through to October between 7.00am and 7.00pm. Click here for other nearby attractions. The third picture below is taken from the gardens of Trewoon looking towards the other side of Poldhu Cove. The other two pictures are of Poldhu Cove from other viewpoints. Poldhu Cove, Cornwall for a luxury holiday cottage beach and sea holiday where the garden gate from Trewoon leads directly on to the Cove.